Beyond unveiling a new system for dining, Royal Caribbean has also unveiled the line-up of dining venues for Quantum of the Seas. While some of the venues have been seen before on existing Royal Caribbean ships, most are new concepts that will debut on Quantum. As discussed above, each of the complimentary dining rooms will have a different concept. “When we started creating these restaurants, we really wanted to make sure we created unique dining experiences We took everything into account, not just the food but the beverage program, the lighting, the music, even the uniforms to make sure the concepts had unique personalities,” said Brian Abel, Vice President of Food and Beverage Operations. (See Royal Caribbean Fact Sheet on Complimentary Dining). The first of the dining rooms is the American Icon Grill. “This is our regional American restaurant. It is not burgers and fries, it is not mac and cheese, it has great regional food [from] throughout the country. The best way to describe it is getting in your car and taking a road trip all around America.” Dishes will include such things as surf and turf (lobster and rib eye steak), New Orleans gumbo and Cajun chicken wings.” Dress will be smart casual. “Silk - - pan-Asian, sharing and authentic. This is an eclectic and balanced menu, really inspired by the Far East. Blending Chinese cuisine, Japanese, Vietnamese, Thai and even a little Indian cooking. Sharing is encouraged in this restaurant. It is more of a family style offering.” It will have dishes like curried lamb, miso marinated eggplant, and hibachi steak. Again, the dress code will be smart casual. “Chic - - this is our modern, innovative refined restaurant. Stunning and sophisticated space where contemporary cuisine comes to life.” Mint crusted lamb chops, jumbo lump crab cakes, and salmon strudel are examples of items that will be served in this venue. Several lines (e.g. Cunard Line, Norwegian Cruise Line and MSC Cruises) have separate restaurants set aside for the guests staying in the ship's suites. Royal Caribbean hopes to take this a step further with a themed restaurant, the Coastal Kitchen. “It is something a little bit special. Pure freshness using Mediterranean influences and the richness of the great farmland of California.” Grilled filet mignon, seared scallops, and various flatbreads are examples of its offerings. Quantum will also have several new specialty restaurants. “If we are raising complimentary dining to a new level, it puts pressure on us to raise the specialty dining to a new level.” Mr. Goldstein observed. (See Royal Caribbean Fact Sheet on specialty dining on Quantum). The flagship of these new specialty venues will be Wonderland. Inspired by the Lewis Caroll tales, this will be a fantasy-land experience. 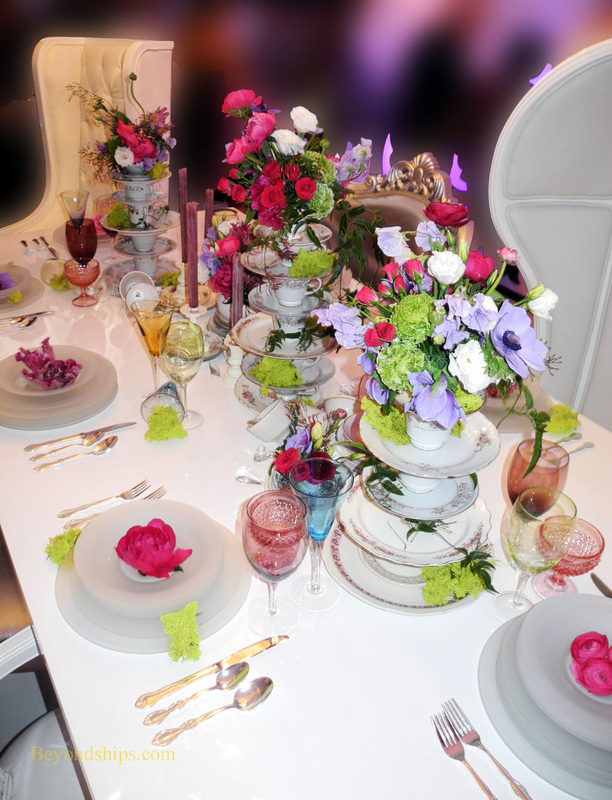 “Wonderland is an elaborate [experience] for the senses in a setting that is mysterious, surprising and fun. It blurs the line between what is real and what you have to use your imagination for. It is really fun, it is creative, it is one of the wows of Quantum of the Seas.” The menu items are divided according to headings that follow the ancient elements of earth, wind, fire, sea and ice as well as a heading for dreams. Items include such things as vanishing noodles, chocolate olive fizz in a clear (and edible) wrapper. Royal Caribbean is also partnering with three established celebrity chefs to create new venues on Quantum. British chef Jamie Oliver has created Jamie's Italian featuring “handmade” dishes inspired by Italian cuisine. (See sample menu). Micheal’s Genuine Food and Drink Pub is a gastro-pub created by chef Michael Schwartz. For healthy dining, the Solarium Bistro will offer items created by cookbook author and chef Devin Alexander. In addition to the new specialty restaurants, Quantum will have Royal Caribbean favorites Izumi, Chef's Table and Chops Grille. “We will have a new menu at Chops Grille,” noted Ms. Lutoff-Perlo. Among other things, it will feature the first dry-aged steaks at sea with each steak aged for nearly four weeks. Turning to casual dining, the very popular Windjammer Marketplace will be revamped for Quantum. “It is really becoming a global culinary pavilion. It is going to have amazing dish stations, specialty coffees, a bakery right at the front to draw everyone in.” Another new feature will be the 24-hour Grill with rotisserie chicken, all-day breakfasts and cheese steaks. Other casual venues will include: Cafe @ Two70 (gourmet sandwiches salads, and soups), the Seaplex Dog House (hot dogs), Sorrentos (pizza), Cafe Promenade (sandwiches, pastries) and Johnny Rockets (hamburgers). (See Royal Caribbean Fact Sheet on casual dining on Quantum of the Seas). Above: An example of the bacon roasted scallop that will be featured on the menu in the Grande Restaurant. Below: The golden beet salad from the Coastal Kitchen. Above: Chefs preparing examples of items that will be served at Chic. 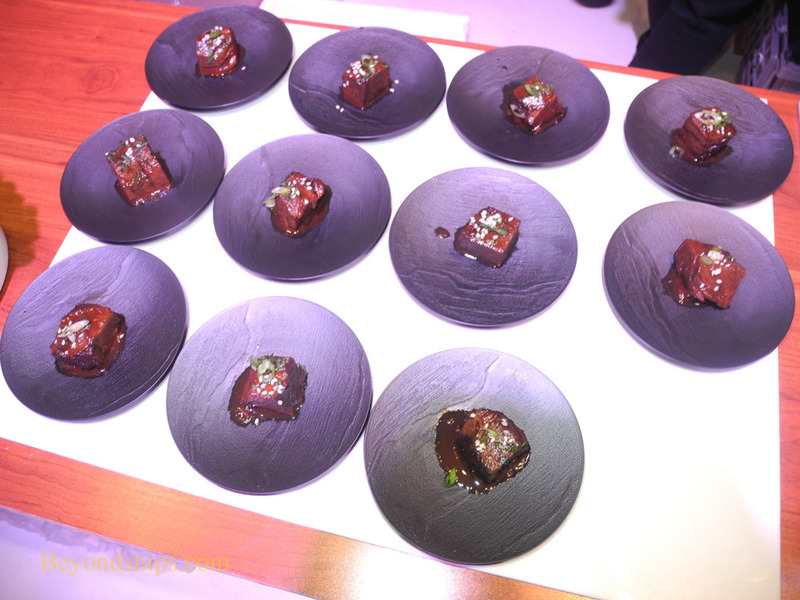 Below: Tastings of the Szechuan beef short ribs from Silk. With a revolutionary dining system and an impressive line-up of new dining venues, Quantum of the Seas will be a formidable competitor in the cruise industry. But will the features that will make Quantum so competitive with the ships of the other cruise lines render the dining offerings on Royal Caribbean's existing fleet obsolete? Royal is in the midst of an extensive revitalization program designed to bring, which has brought some of the dining options that premiered on Oasis of the Seas and Allure of the Seas to its existing fleet. Will the process have to be repeated again so as to maintain consistency across the RCI fleet?